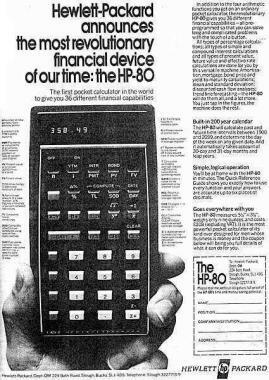 The HP-80 is Hewlett-Packard’s second handheld calculator and their first business calculator. It was introduced in 1973 and discontinued in 1978. This advertisement appeared in the February 1973 issue of Scientific American. Caption: Hewlett-Packard announces the most revolutionary financial device of our time: the HP-80. The first pocket calculator in the world to give you 36 different financial capabilities. Built-in 200 year calendar. Simple, logical operation. Goes everywhere with you.